In the heart of the Lake District, amid dramatic fells and picturesque valleys you will find The Ambleside Salutation Hotel. Enjoying village centre location and boasting breathtaking views, this Lakeland hotel accommodation is ideal for a weekend getaway, midweek break or even a Christmas party! 52 En-suite bedrooms and Club Rooms present guests with an array of facilities and services, such as an in-room refreshments tray, trouser press, hairdryer, telephone, room service, sky television and power shower. 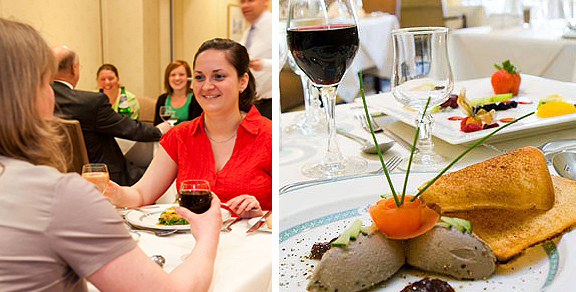 The Garden Room Restaurant and lounge bar provide casual and evening dining venues. The Ambleside Salutation Health Club and Spa now features new state of the art techno gym equipment complete with ipod docking stations. Our relaxing spa leisure facilities include sauna, steam room, crushed ice fountain, tropical shower, indoor swimming pool and a luxurious Canadian hot tub. 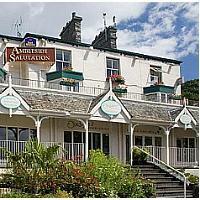 The Ambleside Salutation Hotel offers the perfect ingredients for a Lakeland break to remember! At our luxury Lakeland Hotel, each of our 52 bedrooms has recently been refurbished to the highest standard, with warm colour schemes and co-ordinating soft furnishings. In keeping with the hotel as a whole, our bedrooms are non-smoking throughout. All rooms have en-suite facilities with bath and power shower, and many with the added luxury of a Spa bath bath. Other facilities include television with digital channels, a welcome refreshment tray, free wi-fi, direct dial telephone, hairdryer and trouser press. Many of our bedrooms enjoy views over the fells or the charming village of Ambleside. In addition to our standard rooms, there are family rooms (Child charges apply) and 12 spacious Club Rooms which have bathrobes, slippers, free newspaper and complimentary bottled water. These are available with a £30.00 supplement, per room, per night. All our rooms are non-smoking and well behaved dogs are welcome at £20.00 per dog per stay with notification on booking (NB: well behaved dogs are welcome in certain designated dog friendly rooms in the hotel). If you are planning a special celebration please ask about our Celebration Packages that can include anything from hand made chocolates to Champagne, Flowers and Fruit – all in your room ready for your arrival. Our air-conditioned Garden Restaurant is open to both residents and non-residents for dinner every evening. We offer a 3 course menu, featuring the finest fresh produce from the region. We can cater for any particular dietary requirements and are happy to take special requests in advance. For a more informal meal why not see the wide selection of bar snacks on offer in our Bistro area at lunchtime or in the evening. Our full English Breakfast includes a mouth-watering buffet with a wide range of starters such as cereals and fruits, followed by the option of a Westmorland Grill to set you up for a day walking the Fells! If you’re looking for an experience and destination rather than just a gym, the Ambleside Salutation Health Club and Spa offers you a stylish, dynamic. modern, user friendly and truly innovative exercise environment. Our state- of- the art facilities include the latest in world class Techno gym equipment complete with built in television screens and ipod docking stations . With the addition of our exclusive electronic personal training system and the latest in cardio and resistance trainers, Kinesis and free weights this really is fitness for the future. With a traditional sauna, steam room, 12m indoor pool, tropical shower crushed ice fountain, poolside Jacuzzi and deluxe Canadian hot tub situated in our serenity garden. We feel we can offer you a truly new dimension in luxury and relaxation. All this combined under the one roof including the stunning 3 star BEST WESTERN Ambleside Salutation Hotel and the award winning Oxley’s Blue Fish Spa offering that truly ultimate pamper experience to complete your wellness journey. Leisure facilities for residents from 7.30am till 10.00pm.